The analysis of adsorption from the first stage to saturation is necessary to understand gas/solid interactions. This is the motivation for surface analysis under vacuum. The common approach of dispersed materials surfaces is incomplete since working pressures, that are high enough to achieve reasonable reaction times, do not allow studies of powder surfaces from bare to fully covered. 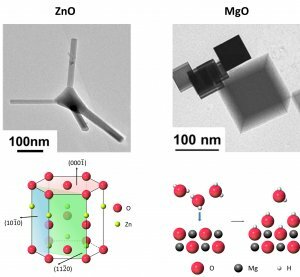 The aim of the present work is to examine the successive changes of ZnO, MgO and ZnxMg1-xO nanopowders upon exposure to water or hydrogen from UHV to the ambient by FTIR. It is shown that ZnO smokes behave in a same way as a collection of single crystals which exhibit (0001), (0001̅), (101̅0) and (112̅0) faces with a non-polar/polar ratio of 75/25. Combining FTIR with XPS and TPD techniques, three stages of hydroxylation were identified on MgO smokes : point defects (10-8 mbar), steps (10-6 mbar) then terraces (> 10-5 mbar). Results indicate a reorganisation of surface structure showing that water adsorption on MgO(100) is an irreversible process. The common model of MgO as a series of (100) facets is questioned. At low concentrations of zinc, the mixed oxide ZnxMg1-xO consists of crystals with similar structure as MgO. 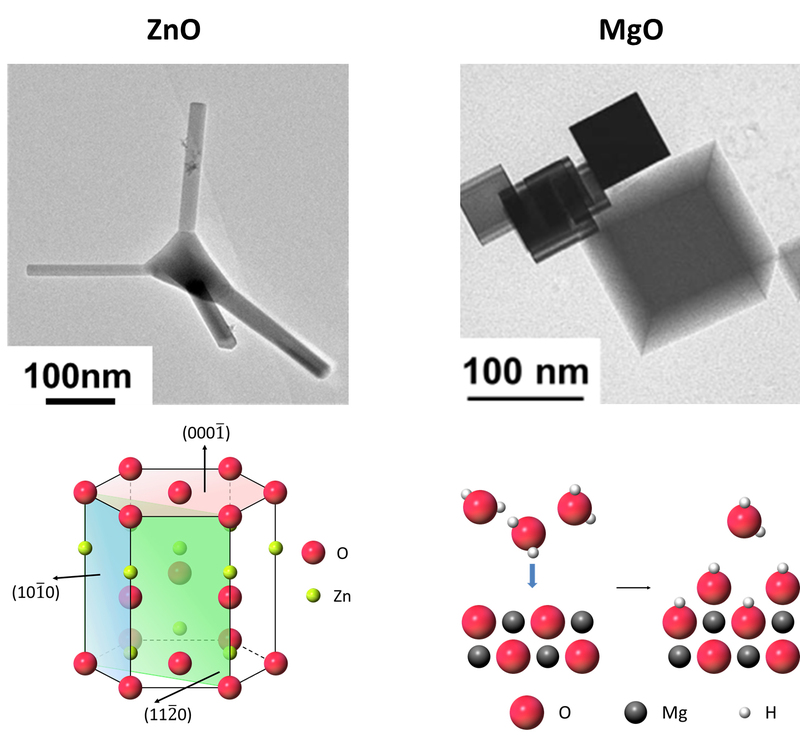 A segregation of Zn2+ toward low coordinated surface sites is suggested to explain the changes in reactivity of the ZnxMg1-xO with respect to water and hydrogen at low coverages. Furthermore, the mixture ZnO-MgO produced by combustion of ZnMg alloy combines the antibacterial properties of ZnO and the biocompatibility of MgO, interesting for potential applications. The overall results demonstrate the relevance of the study of powders in ultra-high vacuum conditions. Keywords : nanopowders ; ultra high vacuum ; MgO(100) ; polar/non polar ZnO ; ZnxMg1-xO ; FTIR.